When it comes to ideas about how life on Earth originated, Americans and Brits see things very differently. 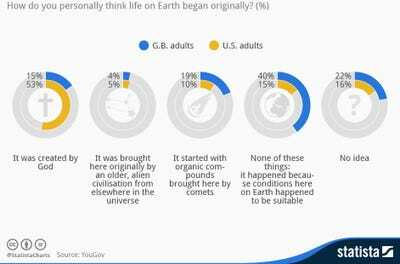 While 40% of British adults think living things arose because “conditions here on Earth happened to be suitable,” (a basic tenet of evolution) just 15% of Americans believe that’s what happened, according to a Statista chart that’s based on a YouGov survey of 994 Americans and 2003 Brits. Practically the reverse is true for creationism, which is much more popular in the US. While just 15% of adults in the UK think all living things were created by God, more than half of Americans (53%) do. American beliefs about evolution fall pretty strictly along political party lines. While just 43% of Republicans said in 2013 that they believe humans and other living things have evolved over time, 67% of Democrats said they think that’s the case, a strong — though not overwhelming — majority. It’s a gap that’s growing, mainly because belief in evolution among Republicans is dropping so starkly. Just four years ago, more than half (54%) of Republicans said they believed in evolution, while 64% of Democrats said they did. Basic science tells us that without evolution, none of us could exist. Aside from the extensive fossil record which shows our ancestors transitioning from tiny, single-celled creatures into mammals and eventually modern humans, our own DNA undeniably links us to the primates that came before us. Most recently, Philae, the lander that made historic contact with a comet last week, found evidence of carbon-based, organic molecules that could have theoretically fallen to Earth and brought the planet its first building blocks for life. As the polls show, seeing isn’t always believing.